Cheerio England, Hello Holland – Run. Ride. Roam. Hmmm, how to fill in many, many hours in a tiny town, on a Sunday, with weather that makes outdoor pursuits difficult and with a cap on funds. Well, we were up for that challenge! We started by leaving our checkout from the hotel as late as possible, then set off on the bikes to find a pub for our traditional Sunday pub lunch. Our final lunch in an English pub. I’d found one in Dovercoat that offered traditional pub food, but as the owners were vegetarians, they advertised as catering for vegetarians and vegans too, so it sounded like a good spot to have our final traditional lunch and fill in some time. We pedalled up the path, left the bikes outside the Continental Hotel in the blustery wind, which was blowing even stronger at the hotel’s beach top location, and found a table inside. We were a little early for lunch, so we started with a pre-lunch drink with the locals and sat and happily listened to the banter bouncing back and forth in the bar. Conversation leapt around from the weather, the wind, the provenance of a bike recently purchased “from a bloke down the Crown for twenty quid” and whether or not the bike was a bit hot or not, to the acceptability or not of receiving telephone assistance for a crossword clue and then the conversation turned to us and our bikes outside the window. We chatted about where we’d ridden and where we were off to and joined in the chat for a while. Then we decided to leave the little gang to their ongoing conversation and we adjourned to the dining room to peruse the menu. With a nice table by the window, we were presented with the menu and I immediately chose the nut roast and for some reason, despite the meat options available, Steve chose this too. I asked if it was vegan, just to be on the safe side and the lady serving us disappeared to check, only to return to say it was vegetarian, not vegan, but she had a notepad with four other choices they were happy to offer as vegan options. What service! None of these were on the menu, but they were going to prepare me something different anyway. Wonderful! While we were waiting for our meals, another couple arrived and sat at a table nearby. The lady turned to us, “Did you hear is moaning? We were just moaning about you stealing our table,” she said lightheartedly. “Oh, have we,” I said. “It’s alright,” her husband said, “we can sit here, we’ll just have to talk to each other,” he laughed. Throughout the afternoon, before, during and after our meal, we chatted on and off to Harry and Jennifer, our lunch neighbours who were now sitting at the less desirable table. They were a lovely couple and Harry told us about being a young boy when war broke out, then about his national service with the RAF and staying on after his service ended. He flew in air shows and had been to Australia to perform in them, travelling around the capital cities. He told us of one close call, when he had to make an emergency landing when he had mechanical problems with the plane. He then had an extended stay in Adelaide, while the plane was being fixed and someone gave him free tickets to the football grand final. Harry was from Wales and was very passionate about his rugby, so we chatted about this and the upcoming World Cup, while Jennifer contributed her thoughts about the England – Scotland rivalry in sport, the ups and downs of Andy Murray in the tennis and her unrestrained joy, when Johnny Wilkinson made that winning drop-goal against Australia at the 2003 World Cup. It was a lovely chat about this and that…Wales, the Welsh language, the early days when Harry and Jennifer had met and the challenges of meeting a family who spoke another language and so our conversation went on. They were warm and friendly and utterly delightful. 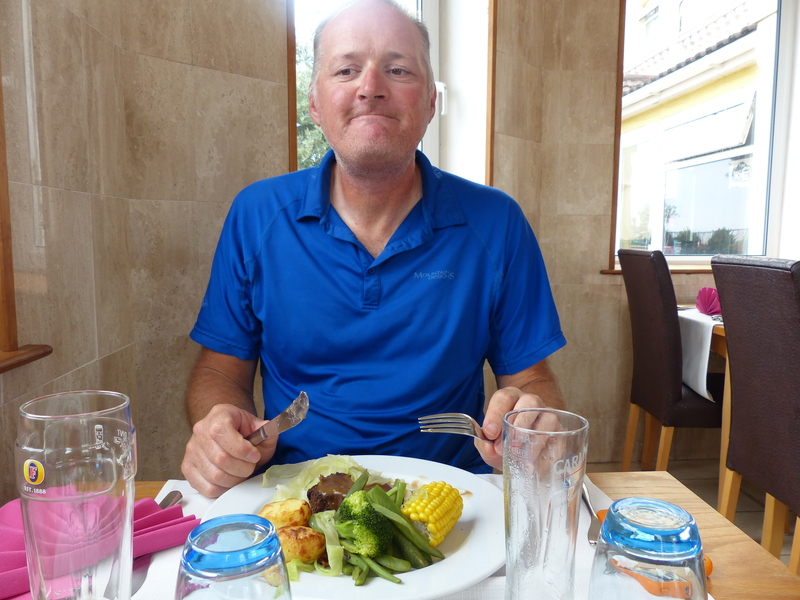 When our meals arrived, I was thrilled with my nut rissoles, couscous and salad and Steve said his nut roast was “Very nice”. I think his expression, as he was devouring it, gave the perfect visual for those words! When the waitress came to clear our plates she asked if we wanted dessert, to which I said no, because there hadn’t been anything on the menu that was vegan. Then, on the off chance, as she was leaving, I asked if there might be any vegan desserts available. 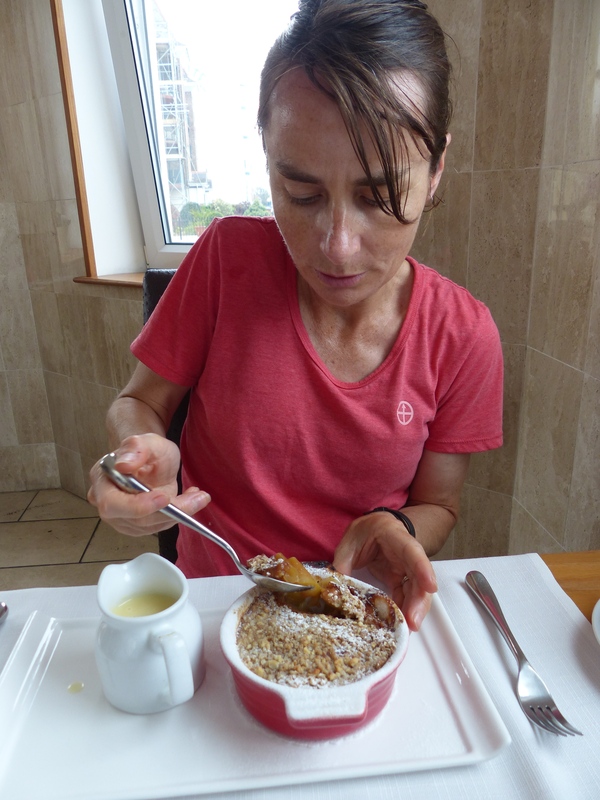 Well, again she returned and despite there being nothing on the prepared menu, she said they could offer me a vegan apple and apricot crumble with soy custard. Oh, how perfect! 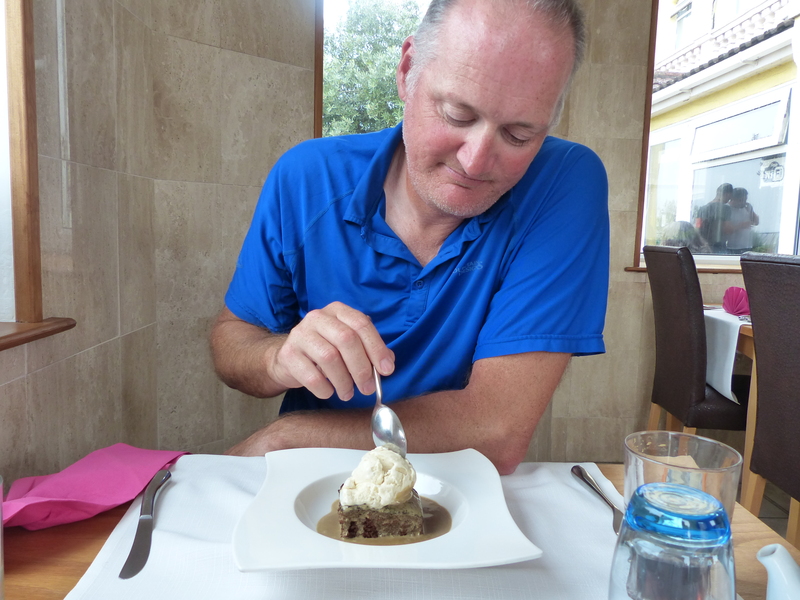 Steve ordered the sticky toffee pudding with soy cream (sticking with his choice to go non-dairy) and we waited in readiness for our Sunday pudding! Then the waitress returned again, to say they could also offer dairy free ice cream if we preferred. Well, Steve’s face lit up at that offer. “Aw yes!” came his response. What wonderful service again, to check on things and return over and over to offer us choices and options. When our desserts arrived, all I can say is, it was amazing! Just good, solid pub grub but it was soooo delicious and my crumble was totally prepared from scratch, still brown and crusty and bubbling at the edges from its recent removal from the oven. It was all utterly, completely and totally perfect. What a fantastic send off and the absolute best, final Sunday traditional lunch, thanks to the helpfulness and hospitality of the hotel, who went to the trouble to offer alternatives and options to both of us. They went out of their way to give us a wonderful meal and we had been given the “Best of British” in terms of hospitality and good, solid pub food. It was great! Well, that had knocked off a few hours! 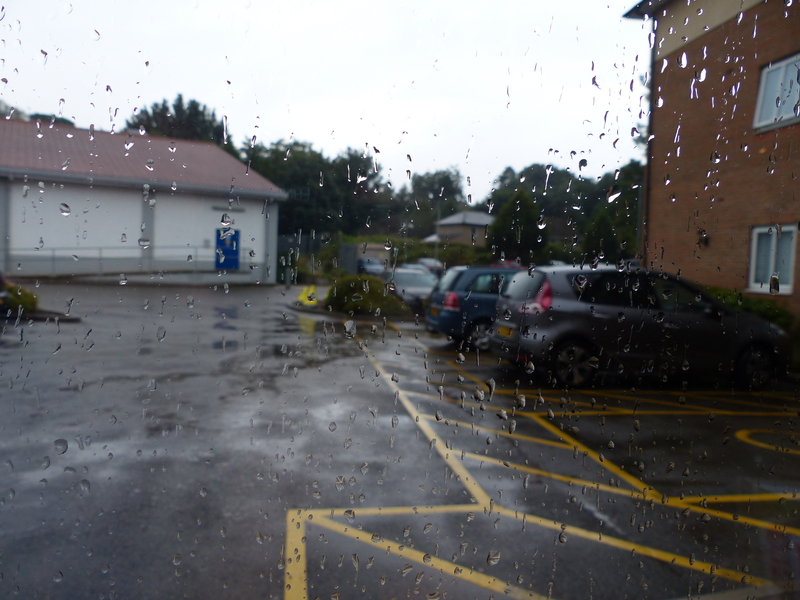 As we left the pub though, down came the forecast rain. Time to move on to seek further shelter. We ended up going to the pub/restaurant beside the hotel we had stayed in, where we left the bikes outside in a spot where we could eyeball them, and then took a table inside. Now to find a way to fill in a few more hours, with only a few remaining notes and coins in our pocket. We struck gold with the words on the menu “free Pepsi refills”. Beaudy! That’s Steve sorted! So that’s what we did. We sat, we watched the rain pour down, we sat through two TV movies, Steve took one for the team and downed six glasses of Pepsi, I sat on a single pot of tea for a few hours and every now and again we’d order a bowl of chips or a salad, just so we didn’t look too rude, hogging a table with free drinks! This challenge was proving to be quite an enjoyable one and not too hard after all! We successfully completed the mission and stayed out of that ol’ rain! By 7:00pm, the rain had stopped, so we decided to start pedalling around to the ferry, to wait in line for boarding. We rolled up to the lane and took our spot behind the VW Combi and the Citroen SUV and waited for the slow crawl towards the check-in window to begin. Slowly, the traffic edged forward and we made it to the booth, handed over our passports and then pedalled on to join the new lines, waiting to get on the boat. As we were waiting, and it was to be a 2½ hour wait, another couple of touring cyclists pulled up behind us. This was when we met the lovely, friendly, Hank and Trui. They had just finished a short cycle tour of Suffolk and were heading home to the Netherlands. The first thing I did was ask to practise some of my Dutch phrases, so they could tell me if I made sense or not. 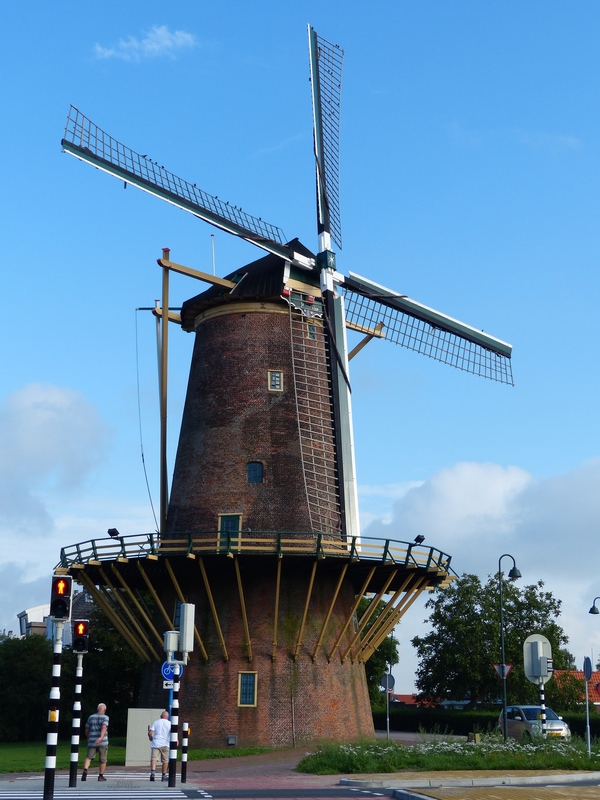 They were very helpful in putting me right with some articulation and explained that we wouldn’t have any trouble speaking English during our time in Holland and everyone would be happy to communicate with us in English. We talked about our trip and then they began suggesting some places to go and routes to take. Our conversation was interrupted by the line finally moving, so we hopped on the bikes, got ready to board and planned to meet again on the ship. We certainly weren’t alone on two-wheels on the ferry! As we rode on, we were a virtual peloton, as touring cyclists seemed to appear from everywhere and, as a group, we pedalled towards the boat. I laughed, as we all rode towards the steep ramp leading to the ferry, because there was a loud chorus of “click…click…click” as we all clicked down our gears and powered up the incline as a hill-killing gang of pedallers! We were on! The bikes were stowed, we found our cabin and then set off towards the restaurant. We met up again with Hank and Trui and joined them for a drink. They then began writing down possible routes and options for places to ride, where we would see the best scenery, or experience some Dutch history and where the routes were set up to be away from traffic. It was so nice of them and it was so much help. We had intended Holland to really be a jumping off point, before we headed south and hadn’t really intended to spend too much time there, but after speaking to Hank and Trui, I think our plans have changed, because they made it sound so beautiful and interesting and definitely worth exploring more widely than we had planned. I’m so glad they pulled up behind us in line! It was so nice to meet them, they were a lovely and entertaining couple and so friendly and helpful. They did us a great favour with the time they spent talking to us and helping us with plans for our onward journey. We have been so lucky with the wonderful people we’ve met along the way and our introduction to meeting the Dutch, began with this wonderful couple! Time to get some shut eye, with the voyage only being a short one of seven hours, so we knew we’d no longer get our head on the pillow than we’d be docking at the Hook of Holland. Farewell England. This is where we say a final farewell. It’s been a blast. Goodbye and goodnight. As the wake-up song “Don’t Worry Be Happy” was piped through to the cabins, to alert passengers that we would be docking in 90 minutes, Steve and I rolled out of our bunks, had a quick cabin breakfast and prepared to arrive in our new country. It had been the smoothest and quietest ferry crossing we’d had anywhere and even managed to get some decent sleep. The call came over the PA that it was time for those with vehicles to return to their deck, so we set off down the stairs to our bikes, found them safe and sound and got ready to disembark. 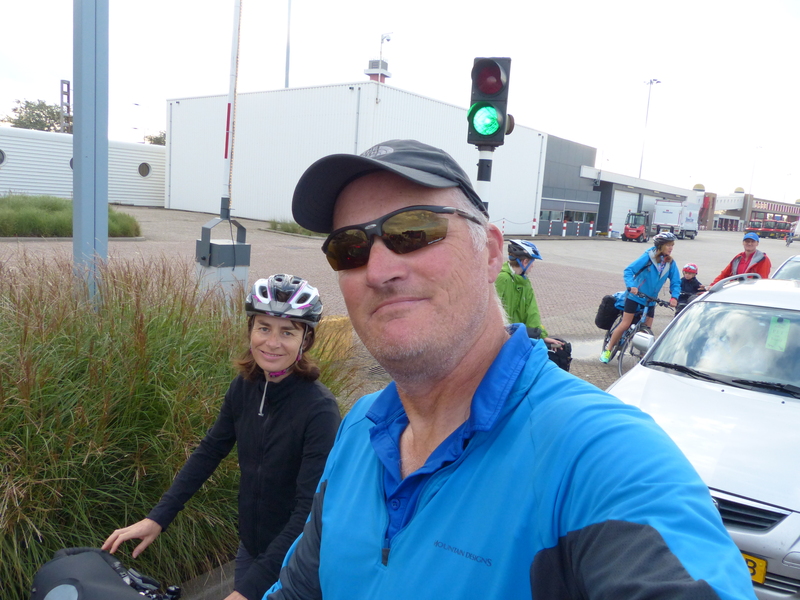 We rolled off the boat, joined the line for passport control, made our way to the booth, successfully answered the questions from the border officer, then we were off…we were in The Netherlands! Our introduction was a terrific one…first we had a path that was totally for bikes, so we had no traffic at all to deal with, then we passed people walking by and they smiled at us! Hello Holland, thank you for that! 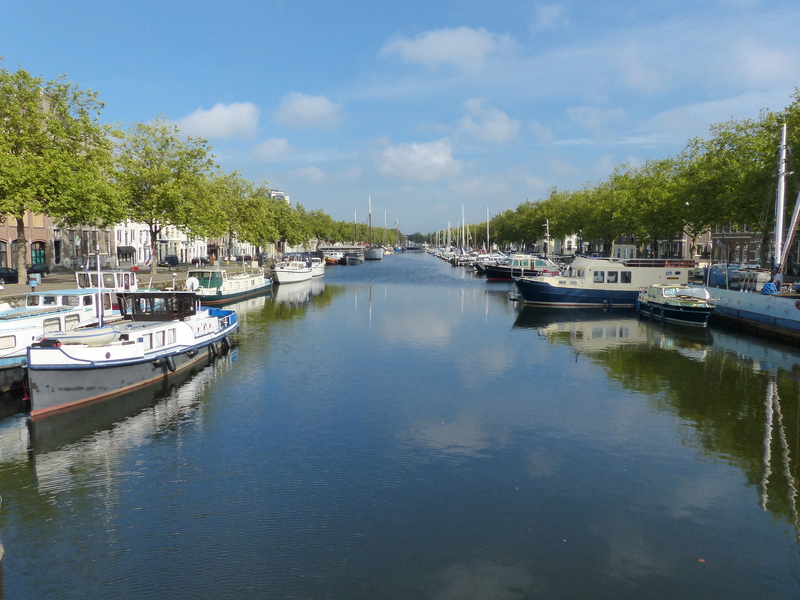 We’d decided to ride into Rotterdam, find some accommodation and base ourselves there for a couple of days to get our bearings and sort out the necessaries before making our way through Europe again. We pedalled along the nice flat path and when we hit our first major town, we saw just how well things are set up here for bikes. We had our own road! I mean, an actual bike road, with traffic lights and give way markings and intersections and everything! This was running alongside the road for other traffic, so we had our own little bike traffic system and it was fantastic! 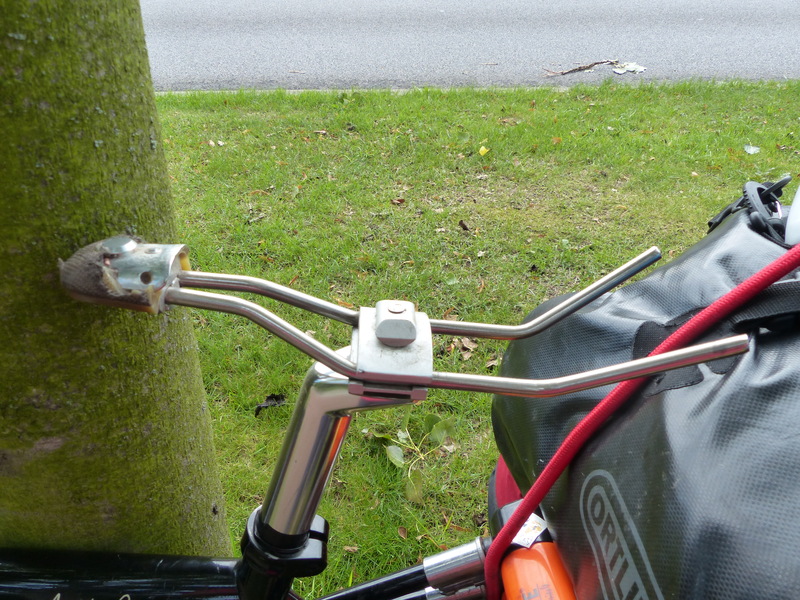 We did have one glitch on our ride in, and once again it involved Steve’s bike seat. It broke! Again! The same seat that had broken previously, that we made a special trip to the Brooks factory in Birmingham, to have fixed. That seat broke again in a new place, so the entire saddle came off and Steve was left with nothing but the metal frame under his already saddle-sensitive rear end. We stopped and he taped it up as best he could, but it couldn’t be ridden on for long, so thankfully we weren’t too far from the end of our ride. Brooks is a dirty word at the moment and for all their declarations of quality, we have had a lot of trouble with these top-of-the-range bike saddles! 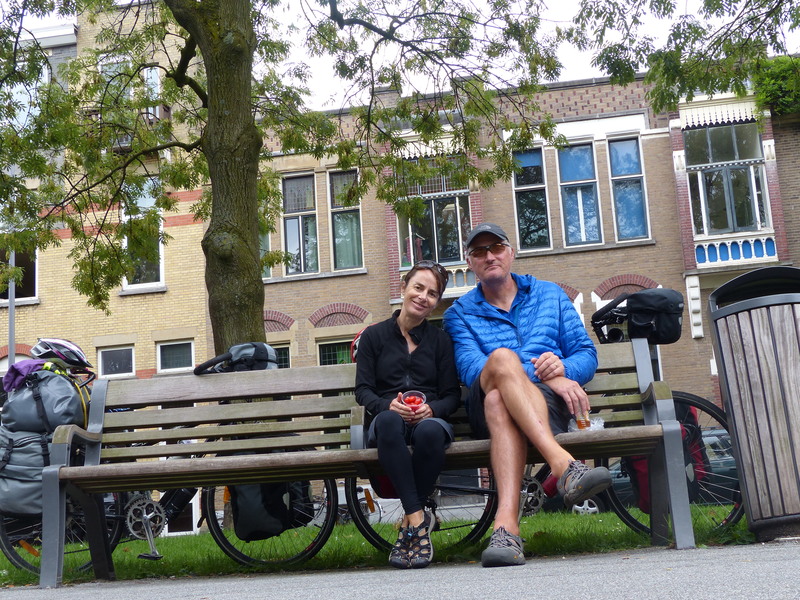 We wheeled into Rotterdam and began researching hotels, while enjoying our first cuppa in a Dutch cafe. We successfully booked a hotel, then pedalled off, found a convenience store, picked up a couple of things for lunch and then sat ourselves in a park. This was when the rain started, so after a hurried munch on some morsels, we began the power-pedal to the hotel, getting a bit soggy along the way. We checked in and after some enquiries here and there, managed to secure a nice spot for the bikes in the hotel’s garage. We also found a bike shop and Steve was able to get a replacement saddle. The bike shop was underneath the train station which also had a bicycle parking area. 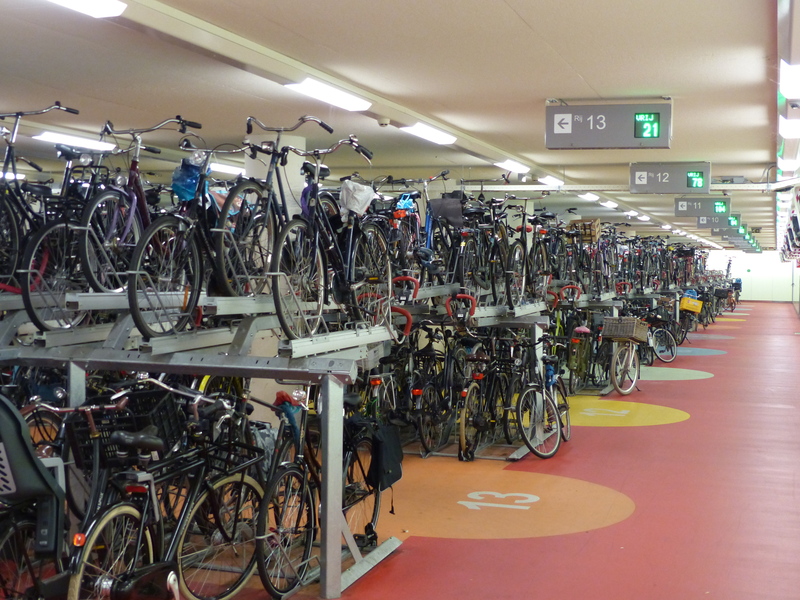 I loved the Dutch version of a multi-storey “car park” for bikes. After settling in, we set off for a roam to our first Dutch supermarket to gather supplies. This is always fun in a new country. I had to go back to relying on pictures and the odd recognisable word, as I read labels. This is a great way to learn new words I think, just figuring out what’s in a packet or a tin! Good fun too! We found that prices here are pretty much the same as England, so certainly not cheap! We gathered our bits and pieces, navigated the checkout and strolled back to the hotel. Just as we returned, the thunder began to roll, the rain pounded down and the lightning flashed. It was great to watch out the window from the comfort and shelter of our room! 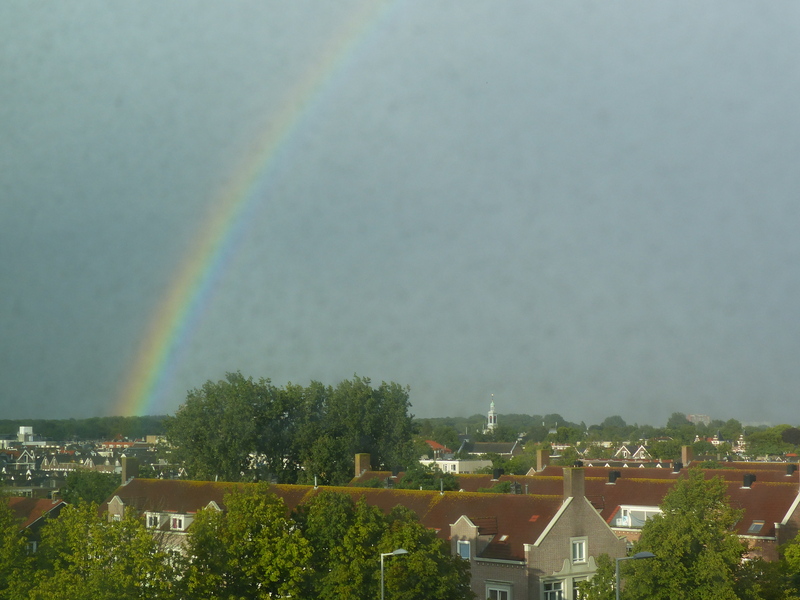 Then, the storm delivered a glorious rainbow as a finale. Gorgeous. 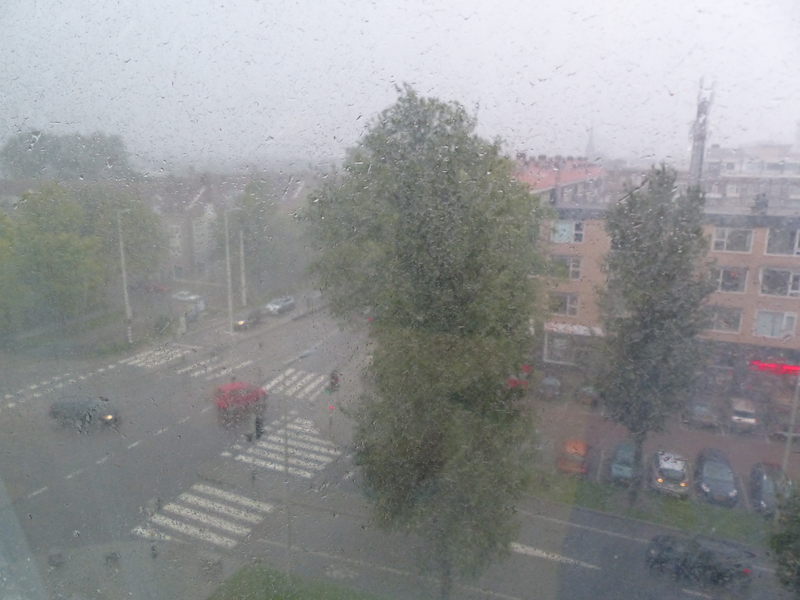 Sorry Holland, we’ve arrived along with our weather jinx! It’s been a nice start to our time in The Netherlands and tomorrow we’ll do some planning, organising and get ourselves set up for our move forward. We’ll consult Hank’s notes and look at our maps and decide where we might head and what changes we might make to our plans, in order to visit some places we’ve now been told about. So on we go…a new country, a new language to learn, new sights to see and experiences to collect. Lucky us! Adventures await! Nut roast is a bit of a cliche when it comes to vegetarians – it’s one of those things that’s associated with the thought of vegetarians being all about wooly socks, sandals and mung beans! I don’t know about the “roast bread” though! Nut roasts are just smooshed up veggies and nuts, so you’ll have to share what you found! I guess it had egg in it or something to bind things together, which could be why it wasn’t vegan. Steve has certainly broadened his culinary horizons though! We might come across your “chap” with the “special” offerings – Steve seems to attract those people because we were approached by a fella offering “candy” in NYC and by the friendly “chaps” in Lisbon when we arrived! Glad to hear the sun’s putting in an appearance there – it isn’t here at the moment, but that’s just our mere presence isn’t it! We’ll carry on regardless! What a wonderful final day in England! I had tears emerge as you talked about your chat with Harry 🙂 people matter and reading your account of his story and your time with him, in spite of your having “stolen” his seat (LOL), blessed my heart! And WOW what service! ..incredibly impressed by that story and quite hungry to boot… what delectable (sounding and looking) dishes were those!!! Kudos to you and Steve for making the most of a rainy day; love, love, love when I have a minute to pop over and catch up a bit on your adventures!! I’m so happy you met up with fellow sojourners as you left one country and entered another. It would appear to me the two of you make friends easily, that tells me much about you; not by luck, I suspect, you meet kind and helpful people. Continue on with a safe and glorious adventure!! You are so right Donna, it was a great final day and Harry and Jennifer helped to make it so! They were just delightful and one of the many things I’ve loved about England is just how comfortable the people are with striking up a conversation with a complete stranger. I’ll talk to anyone, so I’m always happy to oblige and always happy when I strike up a chat and find people are more than willing to settle in and chat back! It just gives travel that extra notch of enjoyment, when we can meet some locals and talk about this and that, or meet people like Hank and Trui who were so gracious and helpful. I’m so glad you’ve been able to join us on this grand tour whenever you have some time, which I know is a precious commodity in your busy schedule. Thanks for being here with us!